Karon Sea Sands Resort & Spa is idyllically situated in the tourist hub of Phuket. Known as the 'pearl of the Andaman Sea', Phuket exudes indescribable intrinsic beauty with its lush greenery, pristine white beaches and the shimmering, crystal-clear waters of the sea. 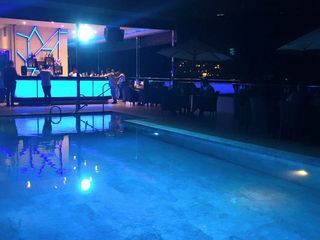 The hotel lies by the white sands of Karon beach nestled amidst beautiful gardens.The hotel offers services catering to the leisure, dining and recreational needs of guests to ensure that each stay is as memorable as possible. Guests can enjoy a romantic stroll on the beach or sit back and watch the sunset and rise. Guests can take advantage of the hotel gym or simply relax with a refreshing drink by the pool. For the more adventurous guest there are nearby leisure activities to be enjoyed. This property is 3 minutes walk from the beach. Offering a restaurant and a bar, it is located just a 3-minute walk from Karon Beach. 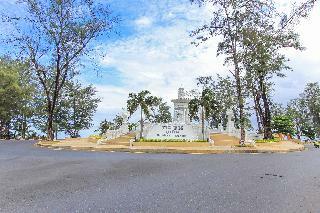 It is about 3.4 km from Phuket Simon Cabaret and 4.3 km from Patong Pier. This hotel offers bright, cosy rooms with city or garden views. During the stay, guests have an access to free WiFi in all areas. Appointed with plenty of natural light, each air-conditioned guestroom at the hotel is complete with a flat-screen satellite TV, a telephone and a minibar. A safety deposit box and a refrigerator are also available in all units. En suite bathrooms are well supplied with free toiletries. At the hotel, guests can approach staff at the 24-hour front desk for luggage storage, fax/photocopying and shuttle services. The accommodation provides airport shuttles at an extra cost. 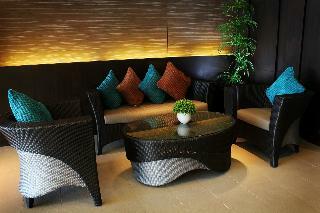 This 4 star hotel is located on the coastline of Phuket Island and was established in 2007. It is close to the Karon Beach. The Hotel has an outdoor swimming pool. All 144 rooms are equipped with minibar, hairdryer, safe and air conditioning.Our creativity sets us apart with fun artistic theme rooms and exclusive installation art displays around every corner, all produced by our in-house designer and staff. Enjoy the fresh air and tropical ambiance relaxing in our large outdoor spaces for an uplifting holiday experience. 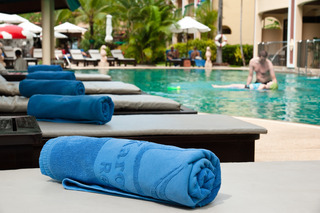 Phoenix Hotel Karon Beach is not just a hotel where guests come to spend the night and leave. Our goal is to entertain, serve, care and provide an unforgettable and wholesome experience to our guests. All guests are meant to come to us as strangers but then leave as family!Perfection and customer satisfaction are our top priorities. In all our properties we aim to have the best location and then use cutting edge design, systems and materials to create property developments that offer top quality living environments and ensure total customer satisfaction.​Phoenix Hotel Karon Beach located on Patak Road (Karon Beach) which is opposite to Karon Park. And Just a minute walk to must-see attraction such as Karon Beach, Shopping centre, restaurants, nightlife, and much more. The resort is located only a few metres from the large expanse of Phuket's finest white sand beach, making it ideal for sun seekers, ocean lovers and sunset admirers alike. It is a 45-minute scenic drive from the international airport, 10 minutes from Patong Beach and 20 minutes from Phuket town. Restaurants, bars and shopping opportunities can all be found in the immediate vicinity.The resort, which was renovated in 2007, enjoys a prime beachfront location, and offers guests classic Siamese architecture, friendly multilingual staff and spacious rooms. It is the perfect choice for your holidaymakers. It is housed in a 4-storey, classic Thai-design building and has 50 rooms in total. It is the perfect size to offer a cosy and intimate atmosphere, while still offering full amenities. It has a lobby with 24-hour reception, 24-hour check-in/check-out, hotel safe, lift access, café, mini-supermarket, hairdresser's salon, bar, restaurant, room and laundry services, fax and mail service, Internet access, currency exchange facility, a jewellery shop, 24-hour security, cycle hire and parking facilities.Each room comes with satellite TV, en suite bathroom with hot water, hairdryer, direct dial telephone, individually-adjustable air conditioning, refrigerator, minibar, coffee making facilities and a private ocean view balcony. The 36 m² superior and deluxe rooms offer the choice of twin beds or 1 king-size bed. The 72 m² Duplex room consists of 2 adjoining rooms, making it perfect for families with children of two couples travelling together. The private balcony in every room is the perfect place to enjoy a coffee or the unforgettable Phuket sunset. The property is situated in the centre of the shopping, dining and entertainment area of Karon. It is only 300 metres from the beautiful sandy beach of Karon, where guests can enjoy the peaceful sea, sun and sand. Phuket Town is approximately a 20-minute drive from the hotel, while the Phuket International Airport is a 45-minute drive away.Catering to the individual tastes and budgets of its guests, this design hotel offers a total of 60 rooms and was built in 2011. With a philosophy of simplicity and attention to detail, the hotel is an ideal retreat for all in search of relaxation and comfort. The hotel offers a lobby with a 24-hour reception as well as lift access, a restaurant and free wireless Internet access. 24-hour security and a convenience store are also available and the hotel offers a reading room as well as room and laundry service and a car park.All of the en suite guestrooms have an impressively spacious layout and offer a private balcony with either a lively city view or a peaceful mountain view. 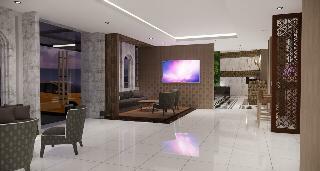 The interior decoration features minimalist design and provides the guest with the ultimate in living comforts including a shower, a hairdryer and a direct dial telephone as well as a satellite/cable TV, free wireless Internet access and a safe. All of the rooms feature a mini fridge and tea and coffee making facilities as well as individually regulated air conditioning.The hotel offers its guests the use of its gym.Guests can start the day with delicious breakfast served at the hotel restaurant and refuel during the day with a full combination of Thai and European cuisines for lunch and dinner. The hotel is centrally located in Phuket and offers easy access to Phuket's most popular attractions. 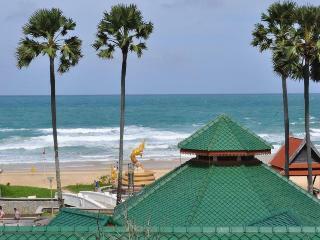 It is only steps away from Karon Beach, one of the longest and most impressive beaches in Phuket. Patong is only 10 minutes away by taxi or tuk-tuk and offers a huge variety of entertainment and dining options. Facilities include 24-hour reception, currency exchange, hotel safe, lifts, restaurants, café, bars, conference facilities, Wi-Fi and a car-park. 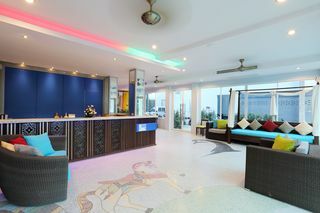 The hotel is also home to the largest kids' club in Phuket, called the Play Zone. The hotel is situated just metres from beautiful Karon Beach where the sea, sun and white sand can be enjoyed. From the hotel is takes 15 minutes to get to the shopping area of Patong Beach and 60 minutes to Phuket Airport.The hotel is a contemporary retreat featuring pleasantly decorated modern suites overlooking the beautiful Andaman Sea. Guests staying here can enjoy their rooms and suites, along with high-tech entertainment and business facilities. The hotel offers a sanctuary of total relaxation and privacy. Fully renovated in 2010, there are 54 rooms in total at this beach hotel. 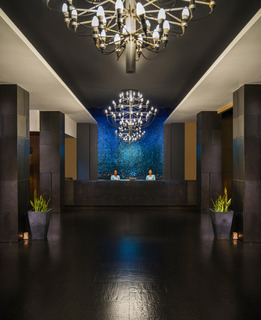 Guests are welcomed in the lobby with 24-hour reception, a hotel safe and lift access to the upper floors. Facilities include air conditioning, a restaurant, Internet access, room and laundry services (for additional fees), a car park and bicycle hire.All of the hotel rooms have been thoughtfully designed to offer the ultimate comforts, technology and the soothing reassurance of feeling at home during the stay. The accommodation units are complete with direct cable Internet access, LCD TV and other facilities. All are en suite with a shower and hairdryer. A king-size bed, direct dial telephone, safe, minibar, tea and coffee making facilities, and a balcony or terrace also come as standard. The air conditioning is individually regulated.Guests are invited to take a dip in the outdoor pool. Sun loungers are laid out read for use and guests can unwind in the hot tub. A sauna, massages and spa treatments are all also on offer for additional fees. The nearby beach is sandy.Lunch is available à la carte and from a set menu. Dinner is also available in set menu form. Ramada Phuket Southsea a Beach Front Resort located at Karon Beach one of the most tranquillity beach in Phuket. 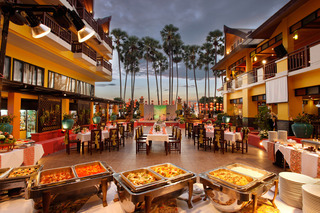 Ramada Phuket Southsea is an unparalleled resort. Astonishing refinement with tropical modern design that defines the true tropical vacation. Experiences uniqueness of luxury living beyond luxurious material, experience a new peace of resort vacation.